Trains are inherently a better system than cars or buses for moving large numbers of people between cities. They tend to both faster and more energy efficient. Steel wheels on steel rails produce very much less friction than rubber wheels on tarmac, and being very long and narrow they need displace little air relative to the number of passengers they carry, again adding to their efficiency. A couple of years ago I wrote a blog about municipalisation and contrasted this with the limitations of both privatized and nationalised industries. Allowing space for start-ups to try new ideas is part of this pluralistic provision. In banking, health care, energy infrastructure and much else Germany has a much more diverse provision of services. One exception is Deutsche Bahn which still runs 99% of the trains in Germany. A couple of weeks ago a new Crowdfunded start-up company called Locomore started operating its first train which runs between Stuttgart and Berlin. They only have one train, an old 1970’s model, painted in retro orange and brown. It’s innovative in so many ways, offering very low fares, with trains using 100% renewable electricity and selling organic fair trade food and drink. Perhaps most innovative of all is a system where you can book a seat near people with similar interests, with the intention of sparking interesting conversation. Ideally we’d like our railways to be powered by renewables. Five years ago I blogged about Deutsche Bahn’s plans to move to 100% renewable energy by 2050. Over the last five years the cost of most forms of renewable energy has come down dramatically and that timescale now looks hopelessly lacking in ambition. Locomore buys renewable electricity for its train, and is one of the first to do so. In Chile the metro system of Santiago gets 60% of its energy from renewables. Many train operators are installing on site renewables. One of my favourite buildings is Blackfriars Station in London, which has an impressive solar roof. Some train tracks are having solar canopies installed and these could in theory supply all the electricity needed to run a whole countries train network. This entry was posted in Buildings, Energy, Transport on 29 December 2016 by Richard. Mongolia is a vast landlocked country sandwiched between Russia and China. It is a member of the Climate Vulnerable Forum who at the Marrakech climate conference signalled their intention to switch to 100% renewable energy. Mongolia has abundant resources of wind, solar and also of coal. In 2012 98% of its electricity came from coal. Its per capita carbon emissions shot up from 1.4 tonnes to 14 tonnes between 1960 and 2013, one of the fastest rates of growth of any country. With a population of only three million and huge solar and wind resources they may be able to reduce emissions impressively quickly. They may also be able to generate huge quantities of cheap renewable energy to export to Japan, Korea and China. Masayoshi Son is a Korean-Japanese businessman, founder and chief executive of SoftBank. In the aftermath of Fukushima he threw himself into solar pv in Japan. Now he is developing a first 50 MW wind farm in Mongolia’s Gobi Desert, with plans to rapidly expand both wind and solar, potentially up to more than 100% of Mongolia’s power needs. The plan then would be to connect up a high voltage direct current (HVDC) grid to export cheap low carbon electricity to Japan, China, South Korea and possibly Russia. This could be the basis for Mongolia’s future prosperity while reducing their carbon emissions, and the emissions of their bigger neighbours. Japan, with its dense population, big industry, poor resource base and high energy prices will probably eventually be the main market, despite the difficulty of it being the most distant. Masayoshi Son and the Japan Renewable Energy Foundation are proposing building a supergrid linking up most of Asia to develop the free flow of low carbon renewable energy from wherever it can be most cheaply produced to where it is most needed and where the prices are highest. I’ve written before about Grenatec and their similar plans, which also included Australia. Eventually the Asian and European grids might be linked up, meaning that for example solar electricity from Mongolia could be used in Europe before our sunrise. There are all sorts of new technologies, such as the elpipe, that look set to bring down the cost and ecological footprint of long distance electricity movements. Technologically the possibilities are very encouraging. The difficulties are much more likely to be political. If political cooperation is achievable the economic and ecological rewards could be huge. This entry was posted in Climate Change, Energy, Global, Politics on 21 December 2016 by Richard. 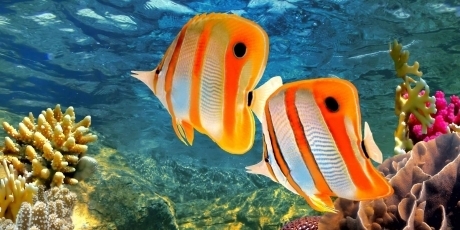 The future of the Great Barrier Reef, and the planet’s climate, will be greatly affected by plans to export vast quantities of coal from Queensland. There is an alternative. Two worlds are colliding. The fossil fuel industry and its pet politicians plan ever greater acts of folly, piling more money into ever more reckless projects. Climate change, ocean acidification and air pollution all suggest it would be more sensible to quit all investment in fossil fuels and just leave them in the ground. There are better, less polluting and increasingly cheaper alternatives. Take what is happening in Queensland, Australia, as an example of the choice humanity must make. In remote northern Queensland a couple of small rays of hope suggest a better alternative. The Kidston Energy Park is just about to start building a 50MW first phase solar photovoltaic project, which it is planned, will then be expanded to 270 MW. What makes this project especially interesting is that a 250MW pumped storage hydro system is planned to be co-located on the site, meaning that excess solar energy from the middle of the day can be turned into more valuable evening electricity, or be stored for use on the occasional cloudy days. The whole project is located at an old gold mine at Georgetown with the pumped hydro system located in the old gold mine workings. This will be a world first, co-locating solar with pumped storage hydro. Another pioneering cleantech project is planned for Hughenden, Queensland. The Kennedy Energy Park is due to start construction in early 2017, with a first phase to be 30MW of wind, 20 MW of solar pv and 2 MW of Lithium Ion batteries all co-located and grid connected. Further expansion of the site would only be possible with improvements to the grid. As I wrote in a blog last August, Australia could be a world leader in solar power. It has the perfect climate. Sadly is does not have the politicians able to take a lead. Last week I blogged about Mauritania, a country with a similar vast solar potential as Australia. Australia has much greater technical and financial clout, and is doing a number of useful projects, but I’d put money on Mauritania getting to a solar powered economy long before Australia, given the strength of Australia’s coal lobby and their political puppets. This entry was posted in Business Investment, Climate Change, Energy, Environmental, Politics on 15 December 2016 by Richard. I’ve written before about Germany’s Energiewende, or energy transition. Germany seeks to become an economy driven by renewable energy, but this is difficult as it is so densely populated, heavily industrialized and has a relatively poor renewable energy potential, being neither very sunny nor very windy. It continues to make impressive progress, but it will be a slow process to achieve 100% renewables energy use for electricity, heating and transport. Some places can make the transition, at least in their electricity sectors, very quickly. 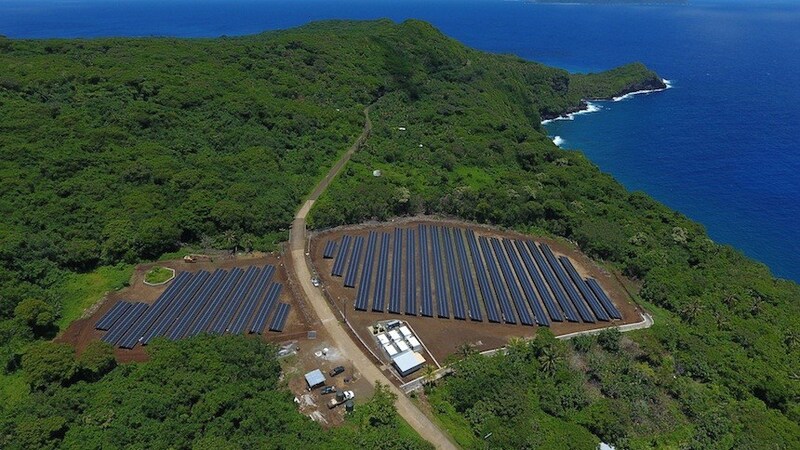 The tiny island of T’au, part of American Samoa, has a population of just 600 and was dependent on expensive diesel generators for electricity. A couple of weeks ago they switched on a 1.4 MW microgrid, powered just by solar panels with Tesla batteries to give three days storage. Given their remote location and sunny climate this will prove much cheaper and more reliable than the old diesel generators. Their conversion from diesel to solar took only a few months. Mauritania is a country not much in the news and seldom seen as a leader in technology matters. However in 2015 it spent a greater proportion of its GDP on renewable energy infrastructure than any other country on Earth. Admittedly its GDP is tiny, but this is still impressive. Like T’au it has been largely dependent on diesel generators. Many people had no access to electricity and those that did experienced frequent power cuts. In a way it is the polar opposite of Germany; sparsely populated, with little industry and a truly vast renewable energy potential, including a windy coast and huge areas of hot sunny desert and semi desert. They have just opened a 30MW wind farm and a 15MW solar photovoltaic farm, both in the capital, Nouakchott. Mauritania’s total grid capacity only seems to be about 150MW, so another dozen or so of these scale projects would see them attain 100% renewable electricity. For remote communities in the interior, solar plus batteries will be the way to bring them electricity. It could all happen very cheaply and very quickly. This entry was posted in Energy, Global on 9 December 2016 by Richard. Friday 2nd December saw two remarkable and rather unexpected election victories in very different places. 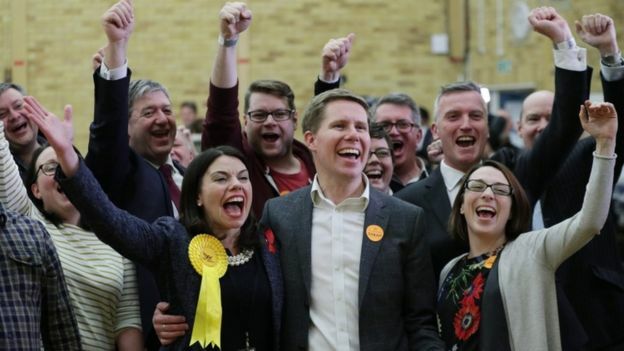 In the affluent leafy suburbs of Richmond Park in south west London Sarah Olney for the Lib Dems overturned Zac Goldsmith’s majority of 23,015 to win with by 1,872 votes. That is one of the biggest by-election swings in history. It was the first election that More United played a part in. The progressive alliance, that they helped build, beat the regressive alliance that had formed between UKIP and the Conservatives who both backed Zac Goldsmith. Labour was one of half a dozen parties to lose their deposits, and rightly so: they should have joined the alliance supporting Sarah Olney. It was a good night for the Lib Dems. What will be even more intriguing is whether it’ll be the start of much greater strategic collaboration by left of centre parties and whether More United really are to become a major force in UK politics. Meanwhile in hot and poor West Africa, Yahya Jammeh the old authoritarian leader of Gambia has just conceded defeat to Adama Barrow in a shock election result. This looks good for democracy. It looks like Gambia has just had its first peaceful democratic transfer of power since it achieved independence in 1965. Seven opposition parties that previously had failed to unite around a single figure managed to cooperate and do so this time: that is why they won. Adama Barrow wants Gambia to rejoin the Commonwealth and the International Criminal Court. These are good signs. Gambia is a desperately poor country and many of its people have come to Europe over the last few years, risking their lives in long desert crossings and in rickety boats crossing the perilous Mediterranean. The Gambia is currently dependent on imported oil for most of its energy needs and consequently has some of the most expensive electricity in the West African region. Most households still don’t have access to electricity. Collecting firewood is time consuming, and tree cover has diminished exacerbating desertification. There is much preventable disease due to poor access to water and sanitation. Gambia has a great solar resource. With the right degree of political cooperation this could be developed to tremendous advantage. I could see a solar based industrial revolution occurring in the Gambia, and indeed in many African countries, to such an extent that they might become quite prosperous and actually attract inward migration. It would of course require a huge degree of cooperation, but that is the take home message from these two elections in Richmond Park and in The Gambia. Cooperation is vital. This entry was posted in Politics on 3 December 2016 by Richard.